Thus Sprach Cramer on Friday morning. Frankly, we don’t know what Zarathrusta said & so we can’t say whether it was right or wrong. But we can say the above comment of Jim Cramer was succinctly true & very important. There is so much institutional respect for the Fed that we all often give far more credit to their ability to see what mortals like us don’t. So it was important to say that people like Clarida, Vice Chair of the Fed, are just people with the same ability to be wrong & to stubbornly justify their error. This was Kaplan walking back Powell’s rash & loose-lipped comments on October 3. But it didn’t move the Treasury market. Then this past week, President Kaplan hosted a public event with Fed Chair Powell in Dallas & smoothly enabled Powell to gently take the sting out of his October 3 comment. Powell acknowledged that the global economy was slowing and almost said that they would be data dependent & not establish arbitrary targets for the eventual neutral rate. 2-year yield down 12 bps on the week, 3-yr yield down 14 bps, 5-year yield down 15 bps, 7-year yield down 14 bps, 10-year yield down 11 bps & the 30-year yield only down 6 bps. This even impressed David Rosenberg who, a week ago, said all Fed systems were a go to 3% or higher neutral rate. David Rosenberg‏@EconguyRosie – The yield on the 10-year T-note just sliced below the 50-day m.a. like a hot knife through butter. The 200-day trendline at 2.95% beckons. But has the Fed already gone too far in raising rates? About 11 countries would say so. Because 30-year rates in these countries are now LOWER than the Federal Funds rate. 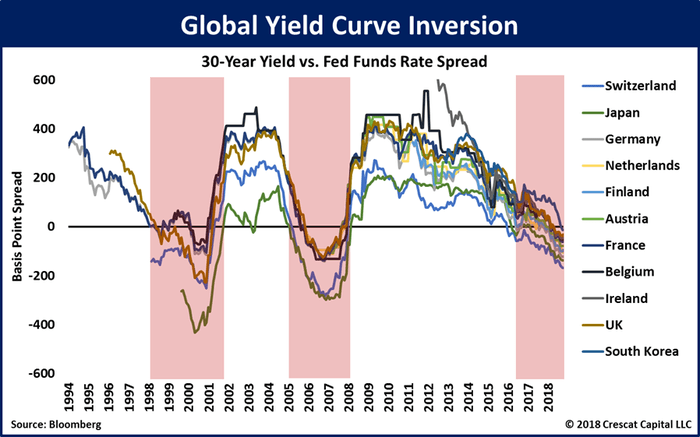 Otavio (Tavi) Costa‏@TaviCosta – Flashing signal of recession ahead: Today’s global yield curve inversion looks just as concerning as the ones that preceded the last two market crashes! We now have 11 economies with 30-year yields lower than the fed funds rate. South Korea just joined the pack last month. Slowing economic growth is one thing but credit blowing up is an entirely different thing. 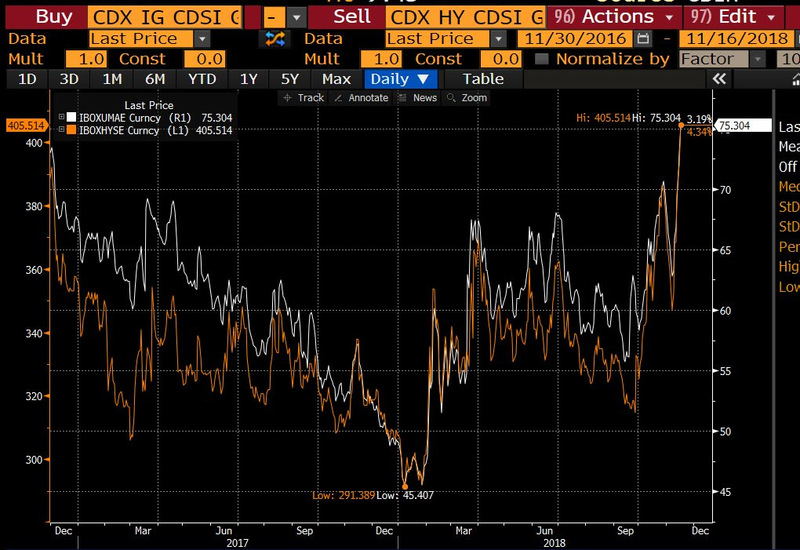 Lisa Abramowicz‏Verified account @lisaabramowicz1 – The weakness in credit continues today, with credit-default swap indexes implying the highest relative yields for both investment-grade and high-yield bonds since late 2016. 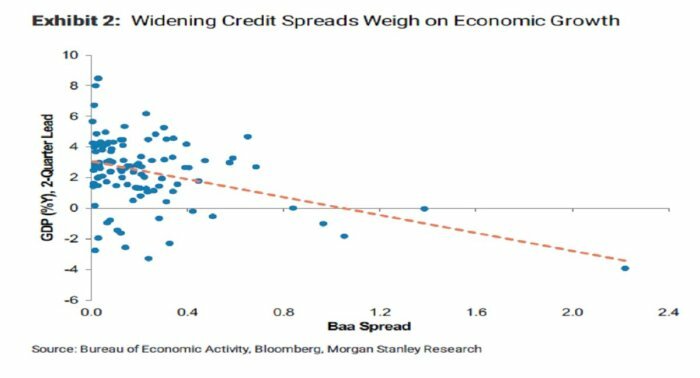 But is there any impact of widening credit spreads on the economy? All this sounds so terrible, doesn’t it? So is there another way to look at how much credit spreads have blown out? This is why the loose-lipped comment of Chair Powell caused so much havoc in stocks, rates & credit. This is also why the Fed has to be circumspect in raising rates from here without clear improvement in the global economy. Yes, that could prove to be a mistake next year but that mistake can be corrected more easily. 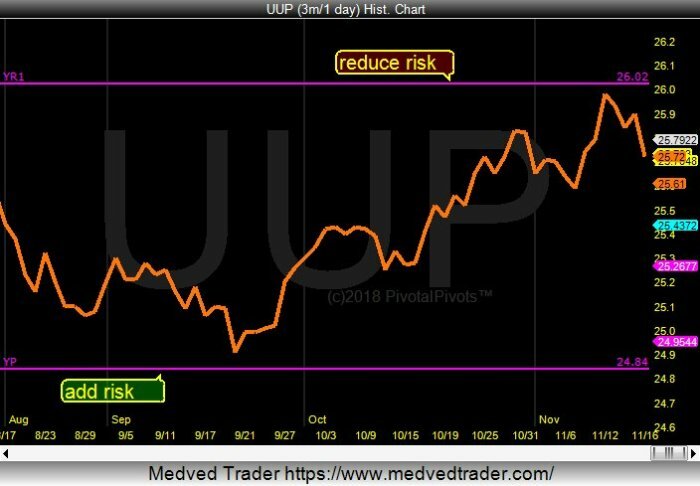 As Ray Dalio told CNBC Squawk Box this week, the Fed has already raised rates to a level where we have hurt asset prices and now the risks are symmetric. 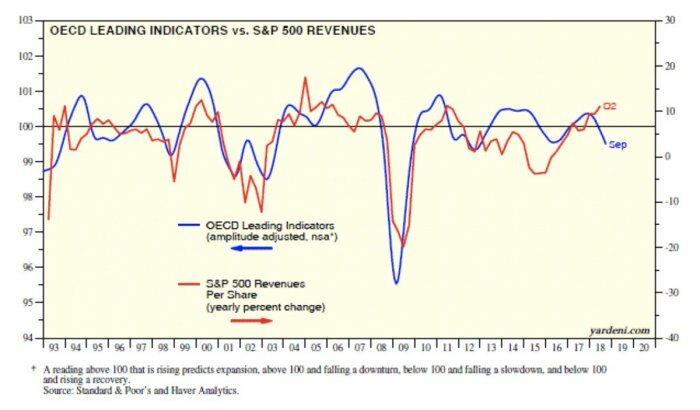 If you have a downturn in asset prices then the economy can be hurt and the Fed doesn’t have tools that are effective in fixing the downside, especially when asset prices are fully priced. This is similar to what Stanley Druckenmiller said in his interview with Real Vision – we get deflation when the Fed deflates an asset bubble. So where is this bubble? Holger Zschaepitz‏ @Schuldensuehner – Divergence between household deleveraging & corporate re-leveraging is striking, Goldman says. Owing largely to significant contraction in mortgage loans, level of household debt remains well below 2008 peak in real terms: a sharp contrast to the significant growth in corp debt. Frankly, lower level of household debt makes this an easier problem to deal with unlike the 2008 kind which created a great recession. While the economy is slowing down, not even Lakshman Achuthan of ECRI expects a recession. Secondly, assuming Mr. Tzitzouris is correct, goldilocks-type interest rates could create a cap on credit problems. 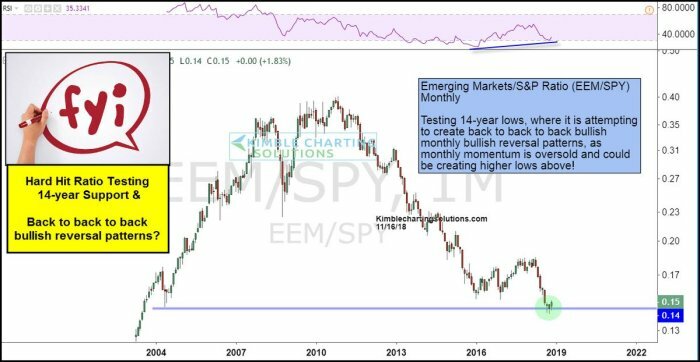 After all, a bull steepening fall in Treasury rates could help a lot. Those who remember October 1994 will agree that we haven’t seen anything yet like the Orange County mess or the Mexican bust. And even those proved manageable after rates began falling in early 1995. So we are encouraged by what the esteemed Fed leadership said this week. 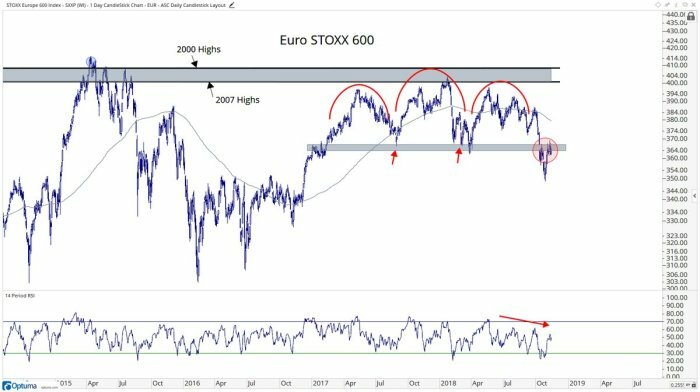 If they keep their balance & look out for contagion coming to US from Europe beset with Italy & Brexit, then a not too hot 2.5% US economic growth can stabilize markets & emotions. And even the Dollar might behave under those circumstances. 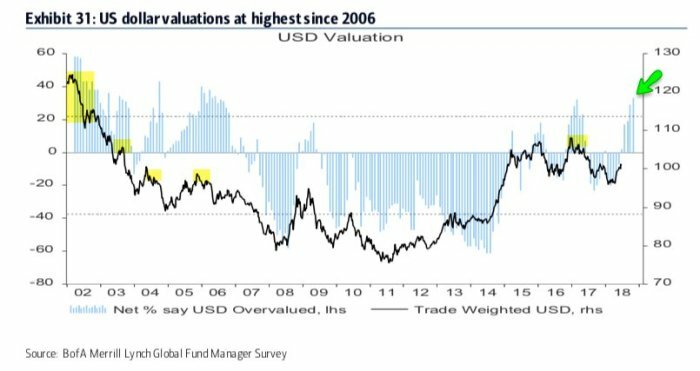 What is the collective wisdom of Merrill Lynch Fund Managers? 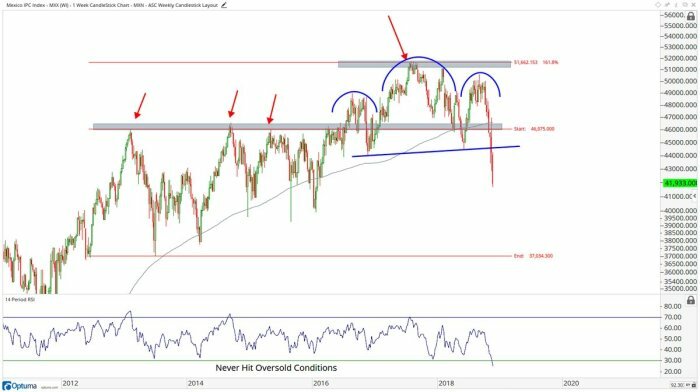 J.C. Parets‏ @allstarcharts Nov 15 – there are so many charts that look like this. 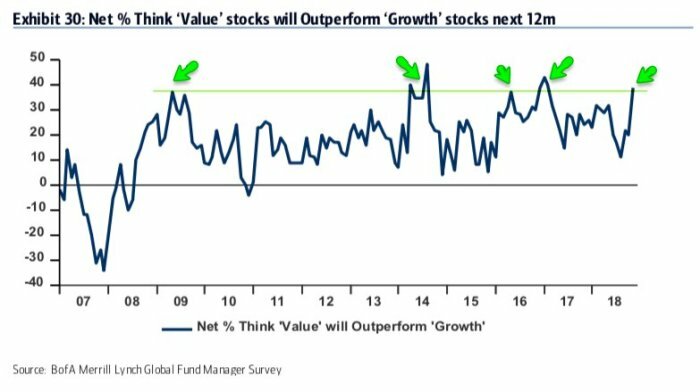 Are these the types of things we see during environments where we want to be buying stocks? SentimenTrader‏Verified account @sentimentrader Nov 14 – The put/call ratio has been above 1.10 on 17 out of the past 30 days, the most since Oct 2015. There have been 27 days with this much of a cluster in history, with a positive return in the S&P 500 two months later after 26 of them. 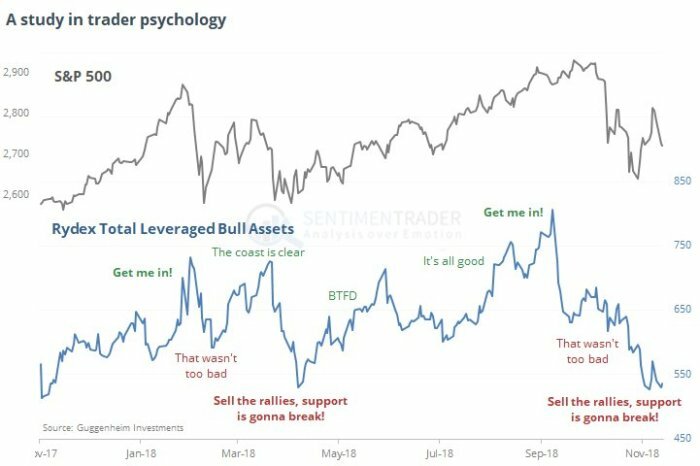 SentimenTrader‏Verified account @sentimentrader Nov 14 – – The sentiment of Rydex mutual fund traders has been interesting. 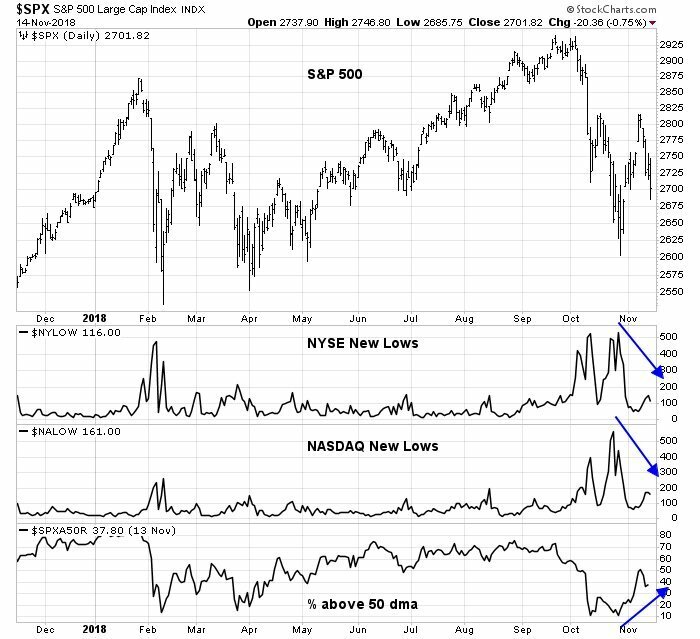 Like in April, they seem to be back to believing lower lows are ahead.